On November 1, 2009, new owners Gregory Kanas, Cathy Matarese, and Katherine Mitchell, were fortunate enough to be able to open the doors at 6917 Capital Boulevard in Raleigh, as ANTIQUESat Gresham Lake, in the space formerly occupied by Gresham Lake Antique Mall. Many of the original 40+ dealers chose to stay with the new venture. 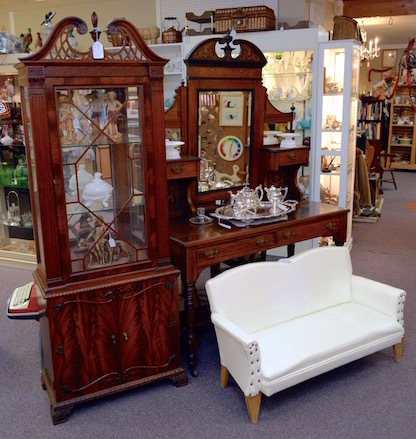 With many years of combined experience in antiques, collectibles, and shop management, we strive to provide our shoppers with a pleasant shopping environment including friendly faces, clean and neat displays, and some great antique and collectible items. We hope it will be an interesting and comfortable place to look for a quick gift, or spend a few hours hunting for pieces on your list. You can use the google map below to generate driving directions from anywhere. Just click on the 'Directions' link in the popup balloon.